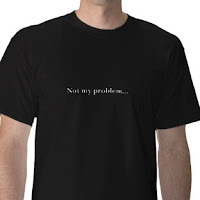 What do you say when you are confronted by people who tell you, "Not my problem!" For example: When you are working at a function and a problem comes up. You go to the person who is in charge of the janitorial duties and instead of trying to work out a solution to the problem, they make a smart remark and say this, "Not My Problem." Here is what I said, "By not making it your problem, you are making it my problem. And, I don't appreciate it!" I know....I know....I am mouthy. That is what one Mom said to me. She wasn't being mean about it, but she is right. When I have to be, I will be mouthy. When it means standing up for what is right, I will do that. After all, the person who had the ability and the resources to help me solve this problem decided to cop an attitude and not take responsibility. This person was being paid to be there....I wasn't. I was choosing to volunteer my time and efforts. When did being helpful, kind, and courteous become unfashionable????? Good for you! Did it get the person to step up to the plate? I hope so!